Ground Source heat pumps promise to supply most if not all the heating required for any new house without drawing ANY energy from the Electricity Grid! 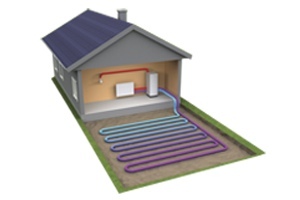 Ground source heat pumps use solar energy naturally stored in soil, bedrock and groundwater as a heat source. They do require electricity to operate, but efficiently produce up to five times as much heat energy for every unit of electricity they use. 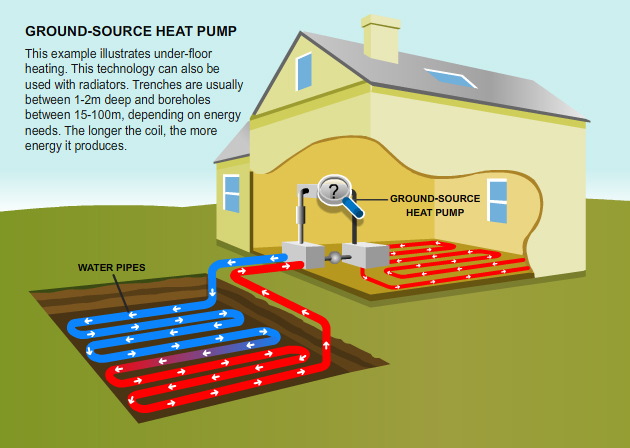 A ground source heat pump circulates a mixture of water and antifreeze around a loop of pipe – called a ground loop – which is buried in the garden. Heat from the ground is absorbed into this fluid and is pumped through a heat exchanger in the heat pump. Low grade heat passes through the heat pump compressor and is concentrated into a higher temperature useful heat capable of heating water for the heating and hot water circuits of the house. 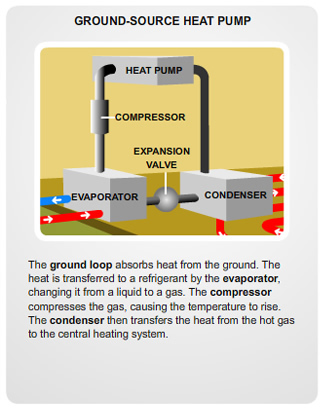 Ground loop fluid, now cooler, passes back into the ground where it absorbs further energy from the ground in a continuous process while heating is required. The length of the ground loop depends on the size of your home and the amount of heat you need – longer loops can draw more heat from the ground, but need more space to be buried in. Normally the loop is laid flat, or coiled in trenches about two metres deep, but if there is not enough space in your garden you can install a vertical loop down into the ground to a depth of up to 100 metres for a typical domestic home. Heat pumps have some impact on the environment as they need electricity to run, but the heat they extract from the ground, air, or water is constantly being renewed naturally. Unlike gas or oil boilers, heat pumps deliver heat at lower temperatures over much longer periods. This means that during the winter they may need to be left on 24/7 to heat your home efficiently. It also means that radiators should never feel as hot to the touch as they would do when using a gas or oil boiler. The efficiency of the system can be greatly improved if the heated water is kept as low as possible. For this reason, underfloor heating, is highly recommended. How is it that a Yacht Can Travel Faster than the Wind ? Are Old Windows Thicker at the Base Because Glass Flows Like Syrup ?